In the current climate of uncertainty triggered by the recent EU referendum, it's becoming increasingly difficult to secure budget and justify marketing spend. A look at the Global Marketing Index indicates that marketing budgets, which have been on the rise in Europe in the past four years, dropped-off after June this year and in recent developments, the chancellor's Autumn Statement downgraded the growth forecast for the next year due to higher inflation and economic uncertainty. This puts marketers under more pressure to prove results from marketing spend and ideally, present the effectiveness of their campaign plans as a foregone conclusion. This search for a new certainty has made the 'science' of effectiveness increasingly popular. 18 months ago, Nina Bibby, CMO of mobile operator O2, set up a cross-divisional team dedicated solely to ensuring and proving effectiveness. Having an impartial effectiveness 'engine' revealing the truth about customers behaviour, drove positive changes such as dropping the 'be more dog' campaign, which led to better commercial results. Royal Mail MarketReach has a team of experts leading in current thinking on the effectiveness of mail and multi-channel marketing. We recently ran our innovative 'Effectiveness Week' of discussions which explored the power of effectiveness and its potential to drive future business and brand decisions. This year we will be sponsoring the IPA's 'Effectiveness Week' to further encourage marketers to embrace accountability and gain recognition for their work. Tuning into consumers problems and understanding their fundamental needs and preferences based on proven behaviour over time, is the constant that can help deliver in a landscape of sharp turns and unpredictable ups and downs. Adopting a strategy of long term planning based on known facts can create the strong framework needed to support short-term flexible responses to unexpected opportunities. We have a long term commitment to help businesses get the best value from investment in mail. Our research regarding how to create effective mail campaigns is now available as 'nickable content' from our Mail Toolkit... It includes a huge range of ready to use content including presentations, stats, case studies and research reports. If you're looking to better understand your target audience, it also features our new Insights Engine which lets you build and download custom reports based on your target audience. While door drops are powerful because they're measurable, their main advantage is still that they compel people to take action, says Sonia Hitzelberger, Account Development Director at door drops specialist Whistl. The beauty of door drops today is just how measurable they are - we've seen great advancements with regards to data and targeting models. As recently as 10 years ago, clients were sending door drops without being able to prove how effective they could be. It's fine to send out a great item, with great offers and great impact, but if you're not evaluating correctly then you're not using door drops to their full potential. "THE BEAUTY OF DOOR DROPS TODAY IS HOW MEASURABLE THEY ARE." Obviously we can still measure responses in a linear way with specific codes or phone numbers, but we should consider using all calls or sales data and match this back to where the door-drops went, such as what sales come through pre and post door drops so uplift can be measured. The more clients buy into it, the more data they provide us with, the better the evaluation and the more enhanced our models become. It's cyclical. The growth of digital marketing has improved targeting in itself. That's one way that we're getting a lot more data, which allows us to build up a bigger picture and a better model. And then of course there are the advancements in mobile technology such as augmented reality. Sky was one of the first brands to embrace this combination of print and digital technology when it launched Sky Atlantic - using a QR code to take customers to an upcoming programme reel. Regardless of the technology, door drops are highly engaging. And quite simply it gets a good return on investment because it's tangible, it comes through the door and people hold it. We know that digital has its place, but we don't want to be inundated with emails; it can be too easy to hit the delete button when our inboxes get too full. With door drops you have to pick them up, that's when it has its chance. We've got stats that show that 30% of all adults see door drops every day; that's more than 40%, then interact with them; and then 90% of those people go online and do something because of it. "WITH DOOR DROPS YOU HAVE TO PICK THEM UP, THAT's WHEN IT HAS ITS CHANCE"
We encourage our clients to really think about the customer journey and how other channels can work in tandem, including other physical channels. Specsavers does this really well - it has a really strong multichannel strategy, but door drops remain and integral part of that. In fact it remains one of its top performing channels. There's also an industry perception that door drops and DM should stand apart, but we think that they should be sequenced. We just need to understand when we should send door drops, when we should send DM and what the effect of that might be. We've seen evidence that if we send the door drops first and then the DM, it can increase response rates of the DM by 40%. It's going to be different for different consumers, of course, but it's about working hand in hand. There are instances where we should say, 'OK, let's look at your model; lets look at your DM database versus door drops.' There'll be times when it will be more cost-effective to use door drops and others when it will be better to use DM. "THE YOUNGER GENERATION ARE ENGAGING WITH DOOR DROPS BECAUSE IT'S A NOVELTY TO GET A PHYSICAL ITEM." Something we've also noticed recently is that younger generations are engaging more highly with print mail and door drops. Why? For them, it's a novelty. They are so used to receiving social media or digital messages, that to actually get a letter or any physical item feels quite important, quite special. They understand that whatever's being received has cost money to print and send, and I think they feel that the brand has paid attention to them specifically. They usually have more expendable income and so are a key audience. But mail and door drops need to stand out to be effective. You're competing with more and more brands and potentially strong offers in the space. So you need to think about that and get your brand values across at the same time. It sounds obvious, but make sure that your offer is clear too. In some cases you can have a great offer and great branding, but if it's difficult to find that call to action, you've lost them and the response. The next big development in targeting door drops is going to be multiple creative approaches, in order to reach multiple audience. It means you can tailor your message and creative to the audience more precisely. The postcode area where you live might be very different to the next one along. There could be more families where you live, versus say a slightly older demographic in an area nearby. We believe advances in digital print technology will make it more affordable to send different message to target different groups. "HOW WE USE SOCIAL DATA WILL PLAY AN IMPORTANT PART IN THE FUTURE OF DOOR DROPS." There are also possibilities arising from social data that we're gathering. How we use this will play a really important part in the future of door drops and message sequencing as part of the whole media mix. What's key is understanding who you're reaching, and who is using social and how to use multiple channels to engage with them in a planned way. If there's noise in your target area, you can use that channel to communicate further with your customers after the door drops and it's something that will serve to enhance the response that we're getting for direct marketing channels. In today’s rapidly transforming media landscape, brands and consumers are communicating in more diverse ways than ever. 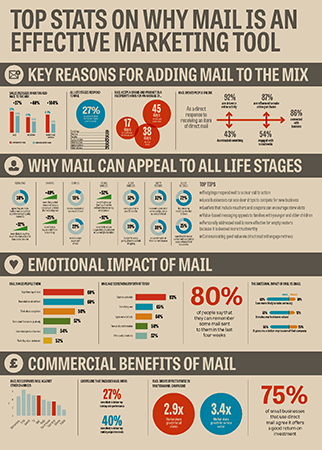 Mail, however, represents a significant point at which communication becomes physical. When First Direct wanted to offer customers a £50 iTunes voucher for recommending their services to a friend, they didn’t send an email which could be deleted at the click of a mouse. Instead they created a mailshot in the form of a game of pass the parcel – an unforgettable piece of mail which neatly conveying the idea of passing on a recommendation. But mail doesn't have to be this elaborate to be effective. For just 60p per pack, the Early Learning Centre (ELC) created highly-personalised birthday storybooks for members of its million-strong Big Birthday Club. These were sent out shortly before the child’s birthday and integrated with the retailer’s website, boosting sales by 8%. It’s been a wise investment for the retailer - for every £1 spent, it recouped £13. Mail doesn’t just help you reach a mass audience - it’s also a great way to get the attention of powerful influencers among your target audience. Get your brand talked about by bloggers, journalists and social networkers by sending them something interesting, relevant and surprising through the post. When Waitrose launched its weekly recipes, it sent the most vocal members of its online community a hamper with the ingredients for the first recipe - a rhubarb and ginger brulée. Half of them talked about it on the forum and Waitrose sold 14 weeks’ worth of rhubarb in four days. With the right data, you can send highly targeted, personalised mail to different groups of customers. In the highly competitive ski-holiday market, Monarch couldn't outspend established airlines, but of analysis of the Ski Club of Great Britain database showed them that Monarch's routes appealed to independent, adventure skiers who were also digitally savvy. The audience was sent a mail pack, which unfolded to reveal a mountain range, with information on fresh ski routes and resorts served by Monarch. By holding a smartphone over the mailing, recipients could access extra content on their mobile through Augmented Reality (AR), whetting their appetites for the coming ski season and linking them directly to the Monarch web site where they could see prices and book online. Monarch was the first UK airline to combine mail with AR, breaking new ground for the industry and leading to 7,201 bookings and £2.2 million in revenue, an impressive ROI of 18:1 on the cost of the campaign. And don’t forget that your transactional mail can be a marketing tool, too. Use your bills and statements to flag up special offers, share company news and tell customers about related products and services. It’s easy to forget that direct mail offers your audience a tactile, sensory experience – they can feel it, play with it, even smell or taste it. It’s portable – you can take it with you to read on the train, in the garden. Coupons can be detached and slipped in a purse or wallet. Some of the most successful online retail brands have used print to build and grow a new client base targeting the affluent consumer, a fish hard to catch in the ocean of digital content. A catalogue or magazine can be an objet d’art, yet also a commercially potent opportunity to reach engaged customers who want to buy. Indeed, participants in our recent research openly admitted that they would irrationally choose a more expensive provider on the basis of the production quality of their mailing (source: Royal Mail MarketReach, Ethnographic Quant, Trinity McQueen 2014). Mail also has longevity. People will keep a well-designed catalogue on their coffee table and a useful mailshot will be filed away for future reference. Just think: you could send something through the post that someone could keep for 20 years – advertising your brand all the while. Mail lives on in the home for between 17 and 45 days – but it is also read, on average, for 22 minutes a day (source: IPA Touchpoints 5, 2014). And this is especially true of brochures and catalogues. 71% of consumers open a brochure or catalogue from a company they have ordered from before and 56% then go on to interact with that company (source: Royal Mail MarketReach, Ethnographic Quant, Trinity McQueen, 2014). Direct mail sends out a message about your company – recipients respond that they get a better, more professional and more personal impression of the sender when they receive a piece of direct mail. And it even drives people online. 92% of people have been driven to online or digital activity as a result of receiving direct mail, with 87% influenced to make an online purchase (source: Royal Mail MarketReach, Mail and Digital Part 2, Quadrangle, 2014). Finally, direct mail doesn’t have to compete with other content, like a TV channel or web site. There are 530 UK TV stations, 821 UK radio stations and 234 million websites… but only one letterbox. The beauty of direct mail is that it enables you to target your audience with pinpoint accuracy – by postcode, demographics, interest, or based on their buying habits. If you’ve a customer database that contains some of this information, you’re sitting on a direct mail goldmine. What’s more, its accuracy is improving all the time. With the world of programmatic buying at our fingertips, we can target messages to customers and prospects based on their buying behaviours and their social media profiles. 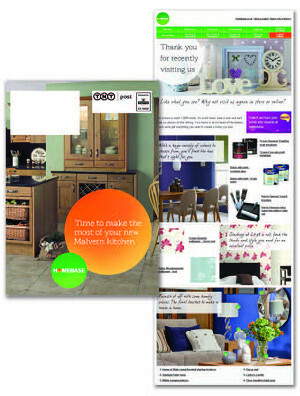 For example, after spending over 750 hours analysing different product, purchase and non-purchase shopping behaviours across online and offline transactions, plus web sites, social media and partners such as Nectar, Homebase was able to identify 10 triggers that were an indicator of potential future customer need. By targeting customers based upon these triggers, each of their direct mail communications is now personalised around a product the customer has already purchased. Dynamic templates make that purchase the feature image, highlight local store details and include offers competitive in that area. Without any additional budget, new systems or additional resources, the data management and print processes have direct mail activity delivered within six days and email in two. And by acting quickly to prompt further related spend the programme has moved average response rates from 9% to 46%, delivering 2% of total sales (£30.4m per year) and shifting ROI from 120% to 346%. And in their latest campaign, data analytics again proved their worth for Homebase, who targeted half a million gardeners with ideas, hints and tips through a multi-layered DM campaign, which delivered £30.2m in revenue and over £866,000 in incremental sales. improve your results and return. You'll also get access to research and insight tools, data planning, workshops and much more - all in a one-stop-shop. Our services are completely free of charge because we're 100% confident in the commercial value that great mail generates.